Through provision of laboratory support, experimental design or cost sharing. Successful implementation of enhanced oil recovery (EOR) is dependent on successful field demonstration. Due to issues of scale, extension of laboratory - and simulator-based research to the field must be validated through pilot-scale testing. The EORI has the means to support field-demonstration projects through experimental design or cost sharing. Our most recent field-demonstration was done in a Newcastle reservoir field in 2014. EORI is currently coordinating a field-demonstration in a Minnelusa field late summer 2016. To inquire about collaborative field-demonstrations, contact us. EORI is constructing a comprehensive database of oil production in Wyoming. 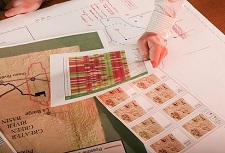 By bringing together information from numerous databases that pertain to oil production in Wyoming into one database, EORI can provide the data concisely and in readily usable form. The database provides the most up-to-date, complete and accurate Wyoming reservoir information to meet the data needs of internal and external stakeholders. Housing the database in Microsoft Access lets EORI use a template system for querying, extracting, and reporting data, as well as provide the data for export and use in assorted software applications. The EORI database ensures that data entry, updates and quality control is as error-proof, streamlined and efficient as possible. EORI promotes technology transfer in two ways. First, EORI encourages EORI scientists and engineers to publish all non-confidential research they undertake. Second, EORI actively facilitates technology transfer by organizing several conferences and workshops each year. Link to conference and workshop pages.